Why Do You Need Weather Shields for Your Car? Driving with an open window in summer creates a pleasant feeling whereas driving with an open window in rain, winter or at higher speeds can cause discomfort inside the car because of the wind noise and spray that affects the passengers in the car. Luckily, there is a way to enjoy the summer breeze or the fresh air in any season with an open window with the help of weather shields. Weather shields, also known as rain guards, window deflectors, wind deflectors or window visors can change your entire driving experience as they make the car interior a much more comfortable environment. They improve the car's aerodynamics by slightly changing its contour. When the wind hits the shields it is redirected over the open windows and around the sides of the car preventing it from entering inside. The major reason you need to install weather shields is that by having them you can keep your car well ventilated and in this way you can reduce the need for the use of air conditioning which will additionally reduce the fuel consumption. Furthermore, they will guard the leading edge of the hood from stones and other debris as well as it will keep the insect from splattering on the windshield. The weather shields are made to the highest standards using tough, impact modified acrylic with longlasting durability. Also, they can be slightly tinted to reduce glare. It is important to know that there are designed individually for each car model so that they can fit the contours of the car perfectly. Also, their design offers optical transparency and sleek aerodynamic styling. When it comes to their installation, you should know that there is no hassle in the process. They can be mounted in two ways: in-channel and stick-on. With the first method of installation, they have a little flange that fits into the window channel of the car door and some models are designed with clips that fit in-between the window channel and the shield to secure it in place. You just need to peel off the protective backing tape before installing. Also, you can remove them with ease although this method might get marks on your windows from frequent up-down contact. 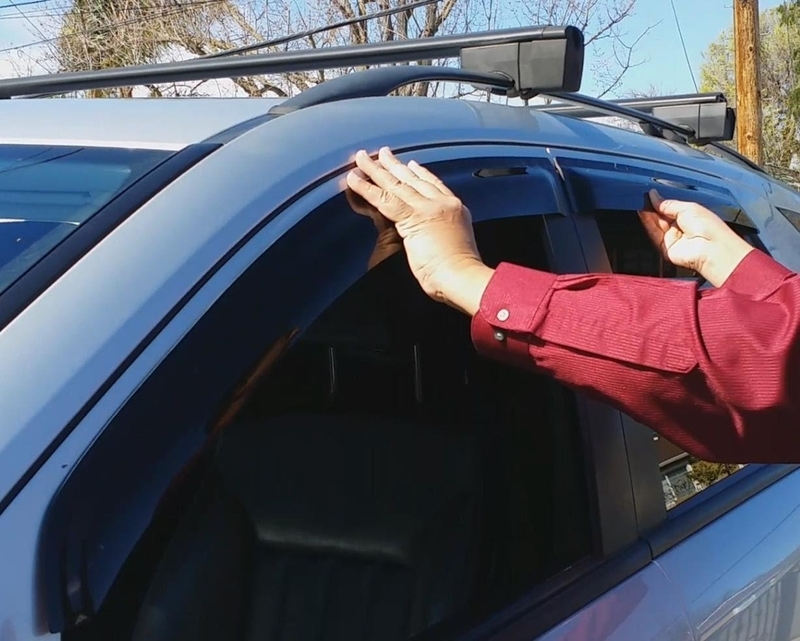 The stick-on method actually enables to stick the weather shields on the exterior of the car's door frames with a special tape above the window channel. It is a more skilful installation process but the main advantage is the fact that there is no interference with auto reverse power windows. In the end, weather shields even though often underrated automotive accessory, are extremely valuable car addition that everyone can afford and should consider buying.